Controversial plans for a ‘hybrid’ development in Llay have been given the go ahead, despite concerns about the impact on local infrastructure. 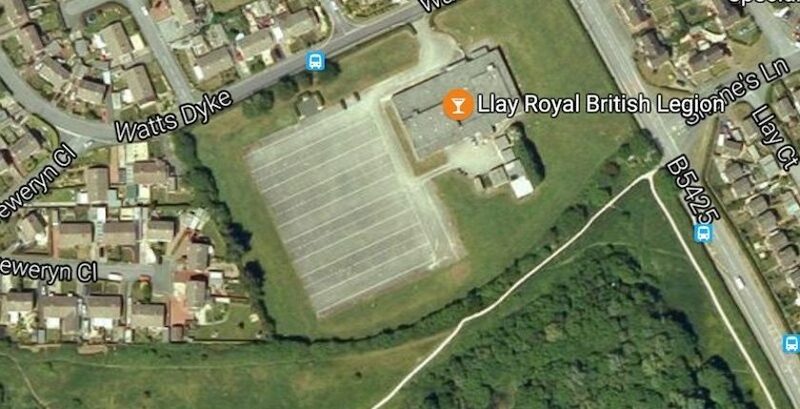 The outline plans for “around 51 dwellings”, a new convenience store and boxing club on land surrounding the Llay Royal British Legion on Watts Dyke were approved by a slim majority of councillors during a meeting at the Guildhall last night. It was the second time plans had gone before the committee for consideration – with councillors initially rejecting the application in summer 2018 amid concerns over pressure on the local health centre and primary school. However a report presented to councillors last night included a response from Betsi Cadwaladr University Health Board which said it had no objections to the proposals. The first public speaker, Maj Donald Moore explained he was not a resident of Llay, but was ‘speaking in general for the armed forces community’. Mr Morpeth then cited the Speaker of the House of Commons and the Speaker’s comments over precedent, and then went on to tell the committee that Magna Carta overrides any planning regulations. In a ranging speech Gandhi, Nelson Mandela, JFK all were name checked, along with a ‘subordinate in the commercial department’ in the Legion who finally replied to a letter from Mr Morpeth. Feedback over proposals for a Co-Op were claimed to be rubbished by the national chairman of the Legion, with the meeting told of a written reply stating he would accept ‘no more mail from Llay’. King John (1166 – 1216) was then called a ‘bully’, and more details of the history of the Magna Carta were given with the inference the national cohort of the Legion were held in similar esteem by the public speaker. Long after the beeping of the committee’s alarm clock Cllr Morris engaged with a minor argument over when three minutes were up, but the public speaker ensured he finished his speech. Speaking in favour of the application the second a spokesperson for the applicant called the plans a ‘win win win’ for Llay. Citing ‘much needed new affordable housing’, a ‘new purpose built boxing club’ and ‘a new Co-Op’ he claimed the development would ‘secure future of the British Legion Club’ noting that survival of such clubs was now based off land sales rather than selling pints to members. The speaker also noted that if the plans were refused and an appeal took place, that would be a costly avenue for Wrexham Council ‘as a charity the British Legion would have duty to to claim to costs’ otherwise ‘costs would come from spending on meeting the needs of ex-servicemen’. The newly installed standards in the Guildhall chamber were pointed to, with it reinforced that the British Legion were not ‘developers’ but ‘a charity’. However Cllr Rob Walsh, who represents the Llay ward, called on the committee to refuse the application again as it is contrary to local planning policy. He said: “Back in July 2018 we had this debate and the committee voted for refusal and I hope the committee will do so again. Not a lot has changed since last time, only a handful of things. “Is there room for the school to expand? There is, but that would make Llay CP very large. Are we going to split it in two again or will money end up filtering to schools in other wards? ‘Unless we know plans going forward I don’t think we can support it. “You may remember me saying in July there were problems with getting GP appointments, it has not got better, it has got worse. “No blame lies with Alyn Family Doctors. They are trying everything they can to make the system work. Such comments were echoed by fellow Llay councillor Bryan Apsely, who said: “This application is no different than before, but we are in a more serious position. He added that he has “grave concerns” over the health board’s “strategic capabilities” – noting that the organisation had said the three sites “could potentially be affected” earlier this year as part of their response to planned housing in Rossett. Cllr Apsely also questioned comments in the report about the local transport network and said that residents on Llay Green and Gresford Road should be asked when they last caught a bus. But planning officer David Williams warned the council would be at risk of losing an appeal and having to award costs to the applicant if the proposals were refused by the committee. He said: “I fully appreciate all the concerns and all the issues been raised in terms of pressure on local health facilities, there is a problem there. What we have to try and do is separate that issue from the consideration of the planning application. “There is a difference, the previous application we didn’t consult with health authority. There is no statutory requirement on a local planning authority to consult, they’re not part of planning process. “Their role is to respond to demand. We don’t use health ground reasons to justify reasons for refusal as there’s no policy on it. There may be pressure there, but that is for the health board to respond to those pressures. “You will all remember the Gresford Road appeal, where the inspector allowed it and health provision was raised as a material consideration. We have some reference point where the the inspector clearly stated that health provision in area wasn’t a material planning consideration. “If you were to use that and encompass it within a reason for refusal we would certainly be at a risk for award of costs. Cllr Marc Jones said he would be supporting the application after “reluctantly concluding” that the committee could not fight the development on planning grounds. He continued onto say: “I do feel need to say something in light of what the applicant’s agent said and the way he said it. I think it was very disrespectful to the people of Llay and the people around these tables tonight. I think he also needs to reflect on that. “I think he also needs to reflect on the fact that the Welsh Government projections on which we are basing a lot of our LDP on are out of date projections. The Welsh Government is reviewing that. “We’ve got 3000 fewer people in Wrexham than what 2014 projections said there would be. There is less of a demand for housing. “I accept health care isn’t an issue the LDP has to consider and it is not an issue we can use here. Our LDP states we need 10 extra GPs to cope with the rising demand. If it is the case we cannot consider health care, why is it in our LDP? “The problem people have got and the problem I have got is I feel our planning system is broken. If people don’t have trust in the planning system, then they will lose trust in our ability to make our decisions. That is a serious problem. Cllr Tina Mannering proposed that the application was refused on the same grounds as last year, stating: “I feel we should be able to. It is broken like Marc says and it needs fixing. Unless we stand up to them they’re just going to carry on. The recommendation was seconded by Cllr Ronnie Prince. However Cllr Mannering’s proposal was voted down – with a majority of councillors voting in favour of approving the application.